The transition from development of standard cytotoxic chemotherapies to highly targeted agents and immunotherapies has resulted in the current breadth of treatment options available.3 Further, increased numbers of targeted therapies are receiving accelerated drug approval alongside companion diagnostic assays, which are critical in identifying predictive biomarkers that allow for a personalized approach to therapy selection.4 A highly focused attack on targetable driver mutations has not only resulted in superior response rates and overall survival (OS) compared to traditional, nontargeted chemotherapy but has also allowed for more rapid time to drug approval, ensuring timely access of life-prolonging drugs to cancer patients in dire need of more options. More recently, there has been a transition in cancer treatment to increased utility of immunotherapies and various combinations of cytotoxic chemotherapies/targeted agents with immunotherapies.5 This ever expanding armamentarium of cancer therapies means greater reliance on biomarkers to help clinicians decide which therapies a particular patient may benefit from. This review aims to summarize updates in cancer pharmacogenomics and genomics-based medicine, including the use of both germline and somatic DNA to personalize cancer therapy, challenges in applying clinical pharmacogenomics to standard practice, and patient perspectives on the use of pharmacogenomics to guide cancer therapy. A predictive biomarker is a marker, or measurable trait, that can be used to identify patients most likely to benefit from treatment and/or those predisposed to toxicity.3 Examples of clinically relevant germline and somatic predictive biomarkers for drug response/toxicity are discussed in the next section of the paper and are the primary focus of this review. Notably, some biomarkers may be characterized as both prognostic and predictive within the same tumor type, such as overexpression of HER2 in breast cancer, which without chemotherapy is considered a poor prognostic biomarker resulting in an aggressive phenotype; however, with the development of therapies targeting HER2 (eg, trastuzumab), this biomarker is also considered a positive predictive biomarker for therapy response. Table 1 provides a summary of cancer therapies with pharmacogenomic information in the Food and Drug Administration (FDA)-approved drug label, and Figure 1 provides an illustration of clinically relevant somatic mutations and drug targets in cancer. Abbreviations: DPYD, dihydropyrimidine dehydrogenase; UGT1A1, uridinediphosphate glucuronosyl transferase 1A1; ALK, anaplastic lymphoma kinase; CD, cluster of differentiation; del(17p), deletion 17p; TPMT, thiopurine-S-methyltransferase; FDA, Food and Drug Administration. 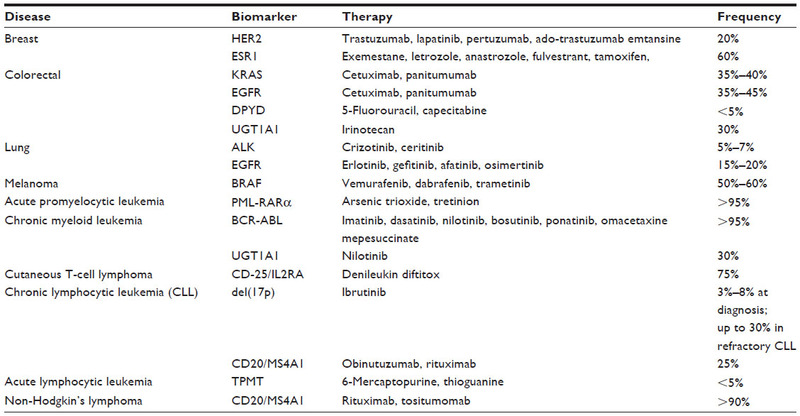 Figure 1 Summary of somatic cancer biomarkers and targeted therapies. Notes: This figure depicts examples of key signaling pathways and downstream effects of mutations within somatic biomarkers, and their respective targeted therapies. Abbreviations: ALK, anaplastic lymphoma kinase; JAK, Janus kinase; mTOR, mammalian target of rapamycin; p13K, phosphoinositide 3-kinase; TDM-l, ado-trastuzumab emtansine; VEGFR, vascular endothelial growth factor receptor. The two primary mechanisms of resistance include MET amplification, which activates the MAPK signal transduction pathway, and a secondary point mutation in EGFR (T790M) that blocks the capacity for erlotinib to bind to and inhibit EGFR.29 The T790M mutation, occurring in approximately two-thirds of resistant cases, results in stronger affinity for ATP, reducing the ability of erlotinib, an ATP-competitive reversible EGFR inhibitor, to bind to the EGFR tyrosine kinase domain.30 Osimertinib (Tagrisso), a novel inhibitor of the EGFR (T790M) mutation, has resulted in ORRs >60% in patients who have progressed on prior EGFR inhibitor therapy and who express the resistant mutation.31 As a result, osimertinib received accelerated FDA approval in 2015, while another T790M inhibitor, rociletinib, is also currently being evaluated by the FDA for approval. As noted with pervious targeted therapies, resistance eventually ensues in most patients with a mean time to diagnosis of first lesion at ~3 months and a median PFS of 6–8 months. The most commonly described resistance mechanisms include RAS and MEK mutations resulting in paradoxical activation of the MAPK pathway. Combining a BRAF inhibitor with a MEK inhibitor has been a logical approach to combat BRAF inhibitor resistance.32 In a Phase III trial, investigators randomly assigned 704 patients with BRAF V600E-positive metastatic melanoma to receive either a combination of dabrafenib (BRAF inhibitor) and trametinib (MEK inhibitor) or vemurafenib as first-line therapy. Results demonstrated an OS rate at 12 months of 72% in the combination group and 65% in the vemurafenib group (HR 0.69, 95% CI 0.53–0.89; P=0.005). The median PFS was 11.4 and 7.3 months in the combination and vemurafenib group, respectively (HR 0.56, 95% CI 0.46–0.69; P<0.001).33 Although dabrafenib and trametinib received approval as monotherapy in 2013, more recently (2015), these drugs received FDA approval to be used in combination to treat patients with BRAF-positive unresectable or metastatic melanoma. A meta-analysis demonstrated a significant increase in toxicity for homozygous variant patients (UGT1A1*28/*28) at medium (150–250 mg/m2) and high doses (>250 mg/m2) (OR 3.2 and 27.8, respectively).43 Importantly, the standard irinotecan dose currently administered to metastatic colorectal cancer patients receiving FOLFIRI (5-FU, leucovorin, irinotecan) is 180 mg/m2 every 2 weeks, without genotyping. The FDA label states that the UGT1A1*28/*28 genotype is a risk factor for severe neutropenia and recommends consideration of an initial dose reduction; however, no specific dosing guidelines are provided. CPIC guidelines currently do not provide dosing recommendations based on UGT1A1 genotype for irinotecan, while the Dutch Pharmacogenetics Working Group44 suggests an initial dose reduction by 30% in *28/*28 patients if the starting recommended dose is >250 mg/m2 (https://www.pharmgkb.org/guideline/PA166104951). More recently, there has been a shift from focusing on the increased risk of toxicity in UGT1A1*28/*28 patients to the potential under-dosing of *1/*1 and *1/*28 patients who are receiving standard irinotecan doses. In fact, a genotype-driven dose escalation study identified irinotecan maximum tolerated doses (MTD) to be 370 and 310 mg/m2 for *1/*1 and *1/*28 patients, respectively, suggesting higher doses than the standard 180 mg/m2 are tolerable in wild-type and heterozygous patients.45 A similar genotype-driven Phase I study demonstrated that the MTD in *1/*1, *1/*28, and *28/*28 patients was 390, 340, and 150 mg/m2, respectively.46 Interestingly, both studies suggests a dose–response relationship, where the ORR in patients treated at higher doses was significantly greater than in patients treated at lower doses (65%–67% vs 24%–25%, respectively).45,46 Further, the second study demonstrated a significant difference in median time to disease progression (16 vs 7 months, respectively; P=0.003).46 Given these Phase I studies were not powered to detect differences in response or survival, investigators are currently conducting a Phase II clinical trial to investigate whether higher irinotecan doses stratified by genotype results in prolonged PFS and OS (ClinicalTrials.gov; NCT02138617). Drug development of highly potent targeted therapies in hematologic malignancies was made promising by milestone discoveries that identified the Philadelphia chromosome, formed by a translocation between chromosomes 9 and 22 fusing the breakpoint cluster region (BCR) with the c-ABL oncogene, ultimately responsible for the development of chronic myeloid leukemia (CML).47 The BCR-ABL translocation occurs in > 95% of CML cases and results in constitutive activation of signal transduction pathways associated with cell proliferation and tumor growth.48 Imatinib was the first TKI discovered in a high-throughput screening assay for agents that inhibit the translocation and approved in 2001 to treat BCR-ABL-positive CML. 6-Mercaptopurine (6-MP) is one of the mainstay treatments for acute lymphocytic leukemia (ALL). It inhibits the formation and synthesis of purine ribonucleotides through the incorporation of thioguanine nucleotide analogs, resulting in cell death. Thiopurine-S-methyltransferase (TPMT) catalyzes the S-methylation and inactivation of thiopurine analogs. Approximately 5%–10% of the population carries at least one variant TPMT allele conferring reduced TPMT enzyme activity, while ~0.5% are homozygous resulting in no TPMT enzyme activity.54 TPMT*2 and *3 alleles account for over 90% of altered TPMT activity. The risk of myelosuppression, the dose-limiting toxicity of 6-MP, is significantly greater in patients who have increased thioguanine nucleotides secondary to defective TPMT activity. CPIC guidelines suggest an initial 90% dose reduction in homozygous variant patients and a 30%–70% dose reduction in heterozygous patients. Based on the FDA label for 6-MP, genetic testing prior to treatment is recommended, but not required, and no dose adjustments are provided in the drug label.58 Importantly, inter-patient tolerability of 6-MP is not completely explained by TPMT genotype alone, as a considerable number of patients with normal TPMT genotype still experience severe dose-limiting myelosuppression, compromising adequate treatment with 6-MP. Yang et al at St Jude Children’s Research Hospital identified a novel SNP in the gene NUDT15, which was significantly (and independently) associated with 6-MP tolerability (rs116855232; P=8.8×10−9).59 In vitro, NUDT15 was demonstrated to act as a protectant by eliminating oxidized purine nucleoside triphosphates to prevent incorporation into DNA. Importantly, the NUDT15 polymorphism was relatively common in East Asians (9.8%) and Hispanics (3.9%), but infrequent (0.2%) in Europeans, emphasizing the critical role ethnic diversity plays in pharmacogenomics. Utilizing genomic data to stratify patients according to targetable lesions can permit the use of smaller numbers of patients needed to treat (NNT) in a given clinical trial and increase statistical power for establishing effectiveness. Unfortunately, there is often the need to screen large numbers of patients to identify those with the genetic marker of interest. While some mutations occur at a relatively high frequency (ie, BCR-ABL in >95% of CML cases,48 C-KIT in 85% of gastrointestinal stromal tumors,60 BRAF in 50% of metastatic melanomas15), others occur at very low frequencies (ie, ALK in ~5% of NSCLCs, DPYD in 1% of the general population). The higher the NNT, the more difficult it is to prove cost-effectiveness of testing. In fact, a cost-effectiveness analysis demonstrated that ALK testing in stage IV nonsquamos NSCLC with subsequent crizotinib treatment for ALK-positive NSCLC was not cost-effective secondary to high drug costs and low biomarker frequency;61 however, given significantly enhanced response with targeted therapy in ALK-positive NSCLC, testing remains routine and standard of care. Single gene testing is likely to be substituted by multiplex genomic characterization using next-generation sequencing technology, particularly as the cost of these technologies continue to decline.62 Obtaining a large genomic panel up front, in the same manner a physician orders a blood or chemistry panel, will allow for decisions to be made downstream, eliminating the barrier of turnaround time. Additionally, the more results available from a single run the more cost-effective the process will be. For example, testing a NSCLC patient for EGFR, ALK, and ROS as single, individual assays may cost just as much, if not more, than running a targeted whole exome panel of hundreds to thousands of genes, which may inevitably provide additional information about other treatment options. Quantification of the economic impact of genomic-driven medicine as well as cost-effectiveness analyses of pharmacogenomic profiling is becoming more important. Despite the potential clinical utility of next-generation sequencing-based diagnostic tests, laboratories and providers continue to struggle to get reimbursed for such tests.63 The reimbursement landscape is difficult to navigate and places test developers in a tough situation as they must demonstrate clinical utility and cost-effectiveness to receive coverage, but demonstrating such utility requires running the test in the first place. As such, many test developers are offering the test at significantly reduced prices in hopes that this will generate enough data to convince payers to provide coverage for such tests down the road. Managing big data and tracking clinical outcomes for patients undergoing sequencing will be key to demonstrate clinical utility and cost-effectiveness. Distinguishing between functional “driver mutations” and random, nonfunctional “passenger mutations” yields a challenge in selecting targeted therapies for intervention.64 Sequencing of matched primary and metastatic tumors has characterized patterns of “Darwinian-like” evolution, with acquisition of driver mutations that promote tumor progression.65,66 Since each pathway contains multiple genes, there are various combinations of driver mutations that can disrupt a pathway important for the dissemination of cancer.67 Common adult epithelial cancers (eg, breast, colorectal, prostate) often undergo five to seven rate-limiting events,68,69 and experimental studies have shown engineered changes in the function of at least five genes is required for transformation into malignant cancerous cells.70 Factors that may help distinguish between driver and passenger mutations include whether the mutation is silent or non-silent, the location or frequency of the mutation, and the depth of sequencing required to detect the mutation. A globally linked database that integrates genomic data and clinical outcomes will be essential as genomics-based medicine continues its assimilation into health care systems.71 Challenges to integrating genomics-based medicine into health care systems include tumor and biologic heterogeneity, limited access to novel targeted therapies, limited eligibility criteria for enrollment of heterogenous populations in clinical trials, and the paucity of evidence-based medicine to guide clinical decisions, that is, lack of large randomized controlled clinical trials. Leveraging health information technology, translational medicine, patient-centered outcomes, and comparative effectiveness research with real-time high-quality data will allow matching of individual patient characteristics and genomic data to provide the evidence needed. The integration of pharmacogenomic testing into routine clinical practice will depend not only on clinician acceptance but also on patient adoption and understanding of the risks and benefits. Ethical concerns, including violation of confidentiality, stigmatization, and social pressure to accept pharmacogenomic testing, are among the many challenges that patients face in the adoption of pharmacogenomic testing. Importantly, these concerns may differ based on the genomic test itself, that is, whether the test involves disease susceptibility variants, drug metabolism/pharmacokinetic variants, tumor targets, etc. Despite the FDA and other consortia’s efforts toward providing information for health professionals and patients about the impact of genetic variation on drug response, there is substantial debate about the clinical utility and safety of pharmacogenomic testing, due in part to the lack of evidence. Studies have reported that the general public is relatively supportive of pharmacogenomic testing, and both physician and patient demand may outweigh concerns regarding the lack of robust evidence.82 Importantly, patients with advanced cancer seem to be motivated to participate in pharmacogenomic testing for cancer therapy; however, this will require further education to understand the clinical utility of testing, differences in germline versus somatic variants, and laws providing protection of patients’ rights (eg, Genetic Information Nondiscrimination Act). Further, surveys of clinicians have demonstrated that the large majority believe pharmacogenomics is important to medication management; however, few have utilized pharmacogenomics, primarily due to lack of knowledge and lack of robust clinical evidence.83 Addressing these concerns will be critical to advance the field of pharmacogenomics and genomics-based medicine in the future. Over 140 FDA-approved drugs require pharmacogenomic information on the drug label, resulting in approximately one-quarter of all outpatients who receive at least one drug which is (are) vulnerable to drug/gene interactions.84 Anticancer drugs are one of many classes of medications greatly impacted by pharmacogenomics given their distinct mechanisms of action, narrow therapeutic indices, and potential to analyze two sets of DNA (germline and somatic). Cancer biomarkers can be used as a diagnostic tool for the early detection of cancers, as a prognostic tool to estimate the course and aggressiveness of the disease, and as a predictive tool to estimate an individual’s response to therapy, including drug efficacy and toxicity. Understanding the intricate molecular profile of tumors will help to discover novel driver mutations, provide a larger breadth of targeted therapy options, and allow for better patient stratification in biomarker-driven clinical trials. Cancer sequencing efforts may capture germline information from matched normal tissue or blood samples, which may be informative for drug/dose selection or disease susceptibility, and somatic mutations, which primarily drive selection of targeted cancer therapies.7 These efforts will generate tremendous amounts of data, and clinicians must be prepared to interpret and utilize this information to optimize cancer therapeutics. A major focus on bioinformatics to readily retrieve actionable information and evidence-based guidelines to translate results into prescribing decisions will be key in the advancement of molecular profiling and selection of targeted therapies. The future of genomic cancer medicine should focus on specimen acquisition of both germline and tumor DNA from early and later phase clinical trials with prospectively collected efficacy and toxicity data. This information will be vital in the discovery and validation of pharmacogenomic associations. Subsequently, genes that have passed replication and validation should be assessed for clinical implementation through proof-of-concept and -efficacy, biomarker-driven clinical trials, which may reduce the required sample size, resources, and time needed to justify clinical uptake. A shift toward large retrospective case-control validation and replication studies and Phase II biomarker-driven clinical trials may allow for a more efficient and rapid method of translation from bench to bedside. As our knowledge of cancer at the molecular level continues to expand, clinicians must understand the therapeutic implications of these pathways and the challenges involved with clinical implementation of pharmacogenomics, including the availability of tests and interpretation of results in clinical practice. The author would like to acknowledge and thank Jeryl Villadolid, PharmD, Levine Cancer Institute, for her assistance in developing Figure 1. Wheeler DA, Wang L. From human genome to cancer genome: the first decade. Genome Res. 2013;23(7):1054–1062. President Obama’s Precision Medicine Initiative [webpage on the Internet]. Washington, DC: The White House; 2015. Available from: https://www.whitehouse.gov/the-press-office/2015/01/30/fact-sheet-president-obama-s-precision-medicine-initiative. Accessed May 5, 2016. Patel JN. Application of genotype-guided cancer therapy in solid tumors. Pharmacogenomics. 2014;15(1):79–93. Patel JN, Mandock K, McLeod HL. Clinically relevant cancer biomarkers and pharmacogenetic assays. J Oncol Pharm Pract. 2014;20(1):65–72. Wang L, McLeod HL, Weinshilboum RM. Genomics and drug response. N Engl J Med. 2011;364(12):1144–1153. Gillis NK, Patel JN, Innocenti F. Clinical implementation of germ line cancer pharmacogenetic variants during the next-generation sequencing era. Clin Pharmacol Ther. 2014;95(3):269–280. Redig AJ, Janne PA. Basket trials and the evolution of clinical trial design in an era of genomic medicine. J Clin Oncol. 2015;33(9):975–977. Biomarkers Definitions Working Group. Biomarkers and surrogate endpoints: preferred definitions and conceptual framework. Clin Pharmacol Ther. 2001;69(3):89–95. van ‘t Veer LJ, Dai H, van de Vijver MJ, et al. Gene expression profiling predicts clinical outcome of breast cancer. Nature. 2002;415(6871):530–536. Harris LN, Ismaila N, McShane LM, et al. Use of Biomarkers to Guide Decisions on Adjuvant Systemic Therapy for Women With Early-Stage Invasive Breast Cancer: American Society of Clinical Oncology Clinical Practice Guideline. J Clin Oncol. 2016;34(10):1134–1150. Tejpar S, Saridaki Z, Delorenzi M, Bosman F, Roth AD. Microsatellite instability, prognosis and drug sensitivity of stage II and III colorectal cancer: more complexity to the puzzle. J Natl Cancer Inst. 2011;103(11):841–844. Popat S, Hubner R, Houlston RS. Systematic review of microsatellite instability and colorectal cancer prognosis. J Clin Oncol. 2005;23(3):609–618. Le DT, Uram JN, Wang H, et al. PD-1 blockade in tumors with mismatch repair deficiency. J Clin Oncol. 2015;33(Suppl): abstr LBA100. Chapman PB, Hauschild A, Robert C, et al. Improved survival with vemurafenib in melanoma with BRAF V600E mutation. N Engl J Med. 2011;364(26):2507–2516. Tran B, Kopetz S, Tie J, et al. Impact of BRAF mutation and microsatellite instability on the pattern of metastatic spread and prognosis in metastatic colorectal cancer. Cancer. 2011;117(20):4623–4632. Kwak EL, Bang YJ, Camidge DR, et al. Anaplastic lymphoma kinase inhibition in non-small-cell lung cancer. N Engl J Med. 2010;363(18):1693–1703. Katayama R, Shaw AT, Khan TM, et al. Mechanisms of acquired crizotinib resistance in ALK-rearranged lung Cancers. Sci Transl Med. 2012;4(120):120ra117. Shaw AT, Kim DW, Mehra R, et al. Ceritinib in ALK-rearranged non-small-cell lung cancer. N Engl J Med. 2014;370(13):1189–1197. Shaw AT, Gandhi L, Gadgeel S, et al. Alectinib in ALK-positive, crizotinib-resistant, non-small-cell lung cancer: a single-group, multicentre, phase 2 trial. Lancet Oncol. 2016;17(2):234–242. Soda M, Choi YL, Enomoto M, et al. Identification of the transforming EML4-ALK fusion gene in non-small-cell lung cancer. Nature. 2007;448(7153):561–566. King CR, Kraus MH, Aaronson SA. Amplification of a novel v-erbB-related gene in a human mammary carcinoma. Science. 1985;229(4717):974–976. Yarden Y, Shilo BZ. SnapShot: EGFR signaling pathway. Cell. 2007;131(5):1018. Lynch TJ, Bell DW, Sordella R, et al. Activating mutations in the epidermal growth factor receptor underlying responsiveness of non-small-cell lung cancer to gefitinib. N Engl J Med. 2004;350(21):2129–2139. Zhou C, Wu YL, Chen G, et al. Erlotinib versus chemotherapy as first-line treatment for patients with advanced EGFR mutation-positive non-small-cell lung cancer (OPTIMAL, CTONG-0802): a multicentre, open-label, randomised, phase 3 study. Lancet Oncol. 2011;12(8):735–742. Miller VA, Hirsh V, Cadranel J, et al. Afatinib versus placebo for patients with advanced, metastatic non-small-cell lung cancer after failure of erlotinib, gefitinib, or both, and one or two lines of chemotherapy (LUX-Lung 1): a phase 2b/3 randomised trial. Lancet Oncol. 2012;13(5):528–538. Sequist LV, Yang JC, Yamamoto N, et al. Phase III study of afatinib or cisplatin plus pemetrexed in patients with metastatic lung adenocarcinoma with EGFR mutations. J Clin Oncol. 2013;31(27):3327–3334. Califano R, Morgillo F, De Mello RA, Mountzios G. Role of mesenchymal-epithelial transition amplification in resistance to anti-epidermal growth factor receptor agents. Ann Transl Med. 2015;3(6):81. Yun CH, Mengwasser KE, Toms AV, et al. The T790M mutation in EGFR kinase causes drug resistance by increasing the affinity for ATP. Proc Natl Acad Sci U S A. 2008;105(6):2070–2075. Janne PA, Yang JC, Kim DW, et al. AZD9291 in EGFR inhibitor-resistant non-small-cell lung cancer. N Engl J Med. 2015;372(18):1689–1699. Sun C, Wang L, Huang S, et al. Reversible and adaptive resistance to BRAF(V600E) inhibition in melanoma. Nature. 2014;508(7494):118–122. Robert C, Karaszewska B, Schachter J, et al. Improved overall survival in melanoma with combined dabrafenib and trametinib. N Engl J Med. 2015;372(1):30–39. Patel JN, Fuchs CS, Owzar K, Chen Z, McLeod HL. Gastric cancer pharmacogenetics: progress or old tripe? Pharmacogenomics. 2013;14(9):1053–1064. Van Kuilenburg AB, Meinsma R, Zoetekouw L, Van Gennip AH. High prevalence of the IVS14 + 1G>A mutation in the dihydropyrimidine dehydrogenase gene of patients with severe 5-fluorouracil-associated toxicity. Pharmacogenetics. 2002;12(7):555–558. Lee AM, Shi Q, Pavey E, et al. DPYD variants as predictors of 5-fluorouracil toxicity in adjuvant colon cancer treatment (NCCTG N0147). J Natl Cancer Inst. 2014;106(12):dju298. Meulendijks D, Henricks LM, Sonke GS, et al. Clinical relevance of DPYD variants c.1679T>G, c.1236G>A/HapB3, and c.1601G>A as predictors of severe fluoropyrimidine-associated toxicity: a systematic review and meta-analysis of individual patient data. Lancet Oncol. 2015;16(16):1639–1650. Deenen MJ, Meulendijks D, Cats A, et al. Upfront Genotyping of DPYD*2A to Individualize Fluoropyrimidine Therapy: A Safety and Cost Analysis. J Clin Oncol. 2016; 34(3):227–234. Caudle KE, Thorn CF, Klein TE, et al. Clinical Pharmacogenetics Implementation Consortium guidelines for dihydropyrimidine dehydrogenase genotype and fluoropyrimidine dosing. Clin Pharmacol Ther. 2013;94(6):640–645. Mathijssen RH, van Alphen RJ, Verweij J, et al. Clinical pharmacokinetics and metabolism of irinotecan (CPT-11). Clin Cancer Res. 2001;7(8):2182–2194. Innocenti F, Ratain MJ. Irinotecan treatment in cancer patients with UGT1A1 polymorphisms. Oncology (Williston Park). 2003;17(5 Suppl 5):52–55. Patel JN. Cancer pharmacogenomics: implications on ethnic diversity and drug response. Pharmacogenet Genomics. 2015;25(5):223–230. Hoskins JM, Goldberg RM, Qu P, Ibrahim JG, McLeod HL. UGT1A1*28 genotype and irinotecan-induced neutropenia: dose matters. J Natl Cancer Inst. 2007;99(17):1290–1295. Swen JJ, Nijenhuis M, de Boer A, et al. Pharmacogenetics: from bench to byte – an update of guidelines. Clin Pharmacol Ther. 2011;89(5):662–673. Toffoli G, Cecchin E, Gasparini G, et al. Genotype-driven phase I study of irinotecan administered in combination with fluorouracil/leucovorin in patients with metastatic colorectal cancer. J Clin Oncol. 2010;28(5):866–871. Marcuello E, Paez D, Pare L, et al. A genotype-directed phase I-IV dose-finding study of irinotecan in combination with fluorouracil/leucovorin as first-line treatment in advanced colorectal cancer. Br J Cancer. 2011;105(1):53–57. Nowell PC, Hungerford DA. Chromosome studies on normal and leukemic human leukocytes. J Natl Cancer Inst. 1960;25:85–109. de Klein A, van Kessel AG, Grosveld G, et al. A cellular oncogene is translocated to the Philadelphia chromosome in chronic myelocytic leukaemia. Nature. 1982;300(5894):765–767. Druker BJ, Guilhot F, O’Brien SG, et al. Five-year follow-up of patients receiving imatinib for chronic myeloid leukemia. N Engl J Med. 2006;355(23):2408–2417. Bixby D, Talpaz M. Mechanisms of resistance to tyrosine kinase inhibitors in chronic myeloid leukemia and recent therapeutic strategies to overcome resistance. Hematology Am Soc Hematol Educ Program. 2009:461–476. Zhang WW, Cortes JE, Yao H, et al. Predictors of primary imatinib resistance in chronic myelogenous leukemia are distinct from those in secondary imatinib resistance. J Clin Oncol. 2009;27(22):3642–3649. Gorre ME, Mohammed M, Ellwood K, et al. Clinical resistance to STI-571 cancer therapy caused by BCR-ABL gene mutation or amplification. Science. 2001;293(5531):876–880. Lierman E, Smits S, Cools J, Dewaele B, Debiec-Rychter M, Vandenberghe P. Ponatinib is active against imatinib-resistant mutants of FIP1L1-PDGFRA and KIT, and against FGFR1-derived fusion kinases. Leukemia. 2012;26(7):1693–1695. McLeod HL, Krynetski EY, Relling MV, Evans WE. Genetic polymorphism of thiopurine methyltransferase and its clinical relevance for childhood acute lymphoblastic leukemia. Leukemia. 2000;14(4):567–572. Relling MV, Hancock ML, Rivera GK, et al. Mercaptopurine therapy intolerance and heterozygosity at the thiopurine S-methyltransferase gene locus. J Natl Cancer Inst. 1999;91(23):2001–2008. Stanulla M, Schaeffeler E, Flohr T, et al. Thiopurine methyltransferase (TPMT) genotype and early treatment response to mercaptopurine in childhood acute lymphoblastic leukemia. JAMA. 2005;293(12):1485–1489. Stocco G, Cheok MH, Crews KR, et al. Genetic polymorphism of inosine triphosphate pyrophosphatase is a determinant of mercaptopurine metabolism and toxicity during treatment for acute lymphoblastic leukemia. Clin Pharmacol Ther. 2009;85(2):164–172. Food and Drug Administration. Purinethol. Silver Spring, MD: Food and Drug Administration; 2003. Available from: http://www.accessdata.fda.gov/drugsatfda_docs/label/2004/09053s024lbl.pdf. Accessed February 17, 2016. Yang JJ, Landier W, Yang W, et al. Inherited NUDT15 variant is a genetic determinant of mercaptopurine intolerance in children with acute lymphoblastic leukemia. J Clin Oncol. 2015;33(11):1235–1242. Heinrich MC, Corless CL, Demetri GD, et al. Kinase mutations and imatinib response in patients with metastatic gastrointestinal stromal tumor. J Clin Oncol. 2003;21(23):4342–4349. Djalalov S, Beca J, Hoch JS, et al. Cost efectiveness of EML4-ALK fusion testing and first-line crizotinib treatment for patients with advanced ALK-positive non-small-cell lung cancer. J Clin Oncol. 2014;32(10):1012–1019. Buettner R, Wolf J, Thomas RK. Lessons learned from lung cancer genomics: the emerging concept of individualized diagnostics and treatment. J Clin Oncol. 2013;31(15):1858–1865. Deverka PA, Dreyfus JC. Clinical integration of next generation sequencing: coverage and reimbursement challenges. J Law Med Ethics. 2014;42(Suppl 1):22–41. Stratton MR, Campbell PJ, Futreal PA. The cancer genome. Nature. 2009;458(7239):719–724. Campbell PJ, Yachida S, Mudie LJ, et al. The patterns and dynamics of genomic instability in metastatic pancreatic cancer. Nature. 2010;467(7319):1109–1113. Vandin F, Upfal E, Raphael BJ. De novo discovery of mutated driver pathways in cancer. Genome Res. 2012;22(2):375–385. Miller DG. On the nature of susceptibility to cancer. The presidential address. Cancer. 1980;46(6):1307–1318. Mendelsohn J. Personalizing oncology: perspectives and prospects. J Clin Oncol. 2013;31(15):1904–1911. Schinzel AC, Hahn WC. Oncogenic transformation and experimental models of human cancer. Front Biosci. 2008;13:71–84. Macconaill LE, Van Hummelen P, Meyerson M, Hahn WC. Clinical implementation of comprehensive strategies to characterize cancer genomes: opportunities and challenges. Cancer Discov. 2011;1(4):297. Meric-Bernstam F, Farhangfar C, Mendelsohn J, Mills GB. Building a personalized medicine infrastructure at a major cancer center. J Clin Oncol. 2013;31(15):1849–1857. Flaherty KT, Infante JR, Daud A, et al. Combined BRAF and MEK inhibition in melanoma with BRAF V600 mutations. N Engl J Med. 2012;367(18):1694–1703. Schilsky RL, Michels DL, Kearbey AH, Yu PP, Hudis CA. Building a rapid learning health care system for oncology: the regulatory framework of CancerLinQ. J Clin Oncol. 2014;32(22):2373–2379. Abernethy AP, Etheredge LM, Ganz PA, et al. Rapid-learning system for cancer care. J Clin Oncol. 2010;28(27):4268–4274. Scheuner MT, de Vries H, Kim B, Meili RC, Olmstead SH, Teleki S. Are electronic health records ready for genomic medicine? Genet Med. 2009;11(7):510–517. Kohane IS. Using electronic health records to drive discovery in disease genomics. Nat Rev Genet. 2011;12(6):417–428. Rogausch A, Prause D, Schallenberg A, Brockmoller J, Himmel W. Patients’ and physicians’ perspectives on pharmacogenetic testing. Pharmacogenomics. 2006;7(1):49–59. Zhang SC, Bruce C, Hayden M, Rieder MJ. Public perceptions of pharmacogenetics. Pediatrics. 2014;133(5):e1258–e1267. Blanchette PS, Spreafico A, Miller FA, et al. Genomic testing in cancer: patient knowledge, attitudes, and expectations. Cancer. 2014;120(19):3066–3073. Haga SB, LaPointe NM. The potential impact of pharmacogenetic testing on medication adherence. Pharmacogenomics J. 2013;13(6):481–483. Stanek EJ, Sanders CL, Taber KA, et al. Adoption of pharmacogenomic testing by US physicians: results of a nationwide survey. Clin Pharmacol Ther. 2012;91(3):450–458. Frueh FW, Amur S, Mummaneni P, et al. Pharmacogenomic biomarker information in drug labels approved by the United States food and drug administration: prevalence of related drug use. Pharmacotherapy. 2008;28(8):992–998. McLeod HL. Cancer pharmacogenomics: early promise, but concerted effort needed. Science. 2013;339(6127):1563–1566. Patel JN, Villadolid J. Cancer Drug Delivery: Pharmacogenetics, biomarkers and targeted therapies. In: Handbook of Research on Novel Approaches for Drug Delivery. Edited by: Rajesh Kumar Kesharwani. Hershey, PA: IGI Global; 2015 (in press). Table of Pharmacogenomic Biomarkers in Drug Labeling [webpage on the Internet]. Silver Spring, MD: US Food and Drug Administration; 2015. Available from: http://www.fda.gov/drugs/scienceresearch/researchareas/pharmacogenetics/ucm083378.htm. Accessed May 5, 2016.